is located in Mobile, Alabama. Our team of successful real estate professionals has worked tirelessly to offer the best possible service while staying focused on the needs of each individual. Our Company is multi-state licensed in Alabama and Mississippi and we've handled countless acres of timberland, farmland, recreational and investment tracts for buyers and sellers all across the South. Our greatest asset is our people and with our team of trustworthy professionals working for you, we are confident that our commitment of service to you is second to none. 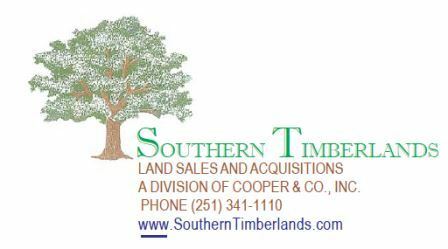 Our many years of expertise in land sales and acquisitions and the professional service we proudly provide are only two of the many reasons why you should look no further than SOUTHERN TIMBERLANDS to help you with the many aspects of buying and/or selling land. If you're looking for property in Alabama and/or Mississippi, it just might be property we already have listed or can certainly assist you in finding. If you're already a landowner, but think the sale of your property might be an option you're considering, we?re here to help! Our team of professionals recognizes the importance of every land transaction and they are ready to assist you with the business of buying and/or selling land. You can be assured that this is business we don't take lightly.....because buying and selling land is our BUSINESS - IT'S WHAT WE DO! Year after year, many of our former customers have become repeat customers and life-long friends because they know what you could soon find out with just one phone call.....providing you with honest, dependable, quality service is #1 to us. THANK YOU FOR CHOOSING SOUTHERN TIMBERLANDS!